The cover of a journal Jack Kerouac kept from 1948-49 while preparing to write "On the Road." The film On the Road, an adaptation of Jack Kerouac’s acclaimed novel of the same name, opens in theaters today. 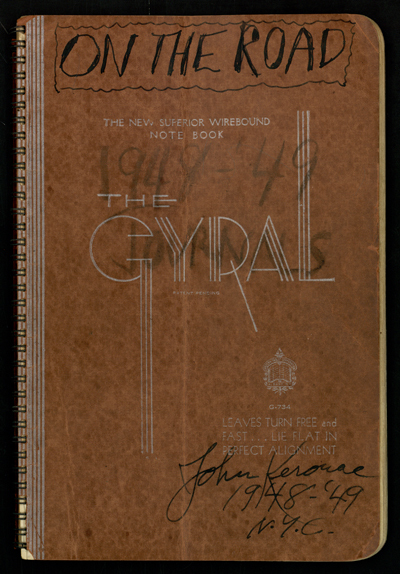 The Ransom Center holds a number of items related to the lives and works of the “Beat Generation” artists, including a journal Kerouac kept from 1948 to 1949 while preparing to write On the Road. In July 2010, a producer for the film contacted the Ransom Center with a request to help the actors access Beat culture and their characters’ personalities. Kristen Stewart, best known for her role in the Twilight films, stars in On the Road as Marylou, a character based on Kerouac’s friend LuAnne Henderson. Kerouac once described Henderson as a “nymph with waist-length dirty blond hair,” but Stewart was eager to develop a more personal understanding of Henderson. Stewart, who said in an interview at the Toronto International Film Festival that On the Road has been her favorite book since she was 15, wanted to do Marylou justice. The interview was part of Barry Gifford and Lawrence Lee’s research for their oral biography of Kerouac, titled Jack’s Book and published in 1978. (Their research materials reside at the Ransom Center.) Gifford also served as a consultant on the film. In the interview, Henderson recalls her passionate but unpredictable relationship with Neal Cassady, whom she married at age 15. Cassady was the inspiration for the character Dean Moriarty in Kerouac’s novel, played in the film adaptation by Garrett Hedlund. The Beats’ travels have acquired legendary status, which undoubtedly puts pressure on actors hoping to portray them convincingly and accurately. Fifty-five years after On the Road was published, archival materials offer the insight to help achieve precisely that.